Immigration is a hot topic in the United States at the moment and there are a lot of statistics floating around in various news stories and in speeches from elected officials. There is a fight happening over the Deferred Action for Childhood Arrivals (DACA) program that’s in the headlines almost daily at the moment. Some people think we need to make it easier for immigrants to become legal citizens and others feel it’s time to drastically cut the number of people coming into the United States each year. No matter what your beliefs are about immigration, though, how much do you really know about it? 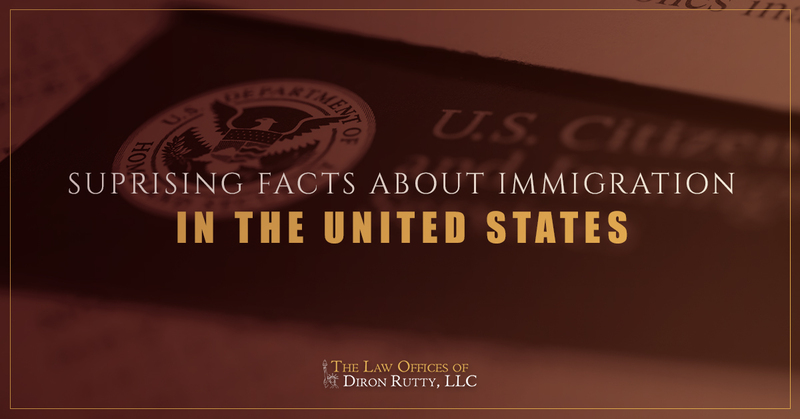 It’s a topic that we deal with every day at the Law Offices of Diron Rutty, LLC, and some of these facts surprised even us when we started to gather them. Take a look and see if any of them surprise you, too. Do These Facts About Immigration Surprise You? The face of immigration is changing. Today’s immigrants are likely to be educated female homeowners, and there are no more likely to be on benefits than a native-born American citizen. No matter what the “average” immigrant looks like, though, it’s likely going to continue to be a hot-button issue in the United States. It has been since our country was founded. It’s important that all citizens stay informed about the facts about immigration so they can make informed choices with their voices and their votes. What’s Going to Happen With Immigration in the Future? What sort of impact will this have on immigration in the future? It’s hard to tell, but polls show that most Americans have more favorable views of Asian immigrants as opposed to Hispanic immigrants. That wasn’t always the case, though; around the time of World War II, there was a very anti-Asian sentiment in the country, particularly towards Japanese immigrants. Only time will tell how public opinion could change on the matter. These facts may answer some of the questions that you have about immigration, but they may not be the only answers that you need, especially if you are currently seeking to be an immigrant yourself. If you have questions about the immigration process and the best course of action for your current immigration status, get in touch with our office. We offer free, confidential consultations on immigration cases. You can give us a call or contact us via the form on our website to schedule your free consultation with an immigration attorney today.